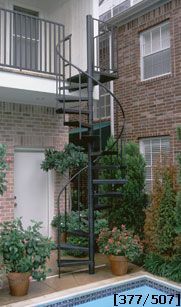 This stairway is our Standard Spiral Kit. It is 48" diameter with 30 degree treads. The handrail is a 1 1/4" round vinyl with balusters made of 3/4" square steel tubing, one per tread. The treads are made of 12 gauge smooth plate steel and are welded to a 4" OD round schedule 40 sleeve. The center column is 3 1/2" OD 16 gauge steel and the landing is a 90 degree square smooth plate steel with 36" guard rails on two sides. The stair is factory painted with red oxide primer with final paint applied by others after installation. The spiral is shipped in boxes with all the hardware and instructions for easy installation by customer.